Due to iOS updates, this app does not work for iOS11. Watch this space! Rather than continuing to update the old app to meet constant iOS updates, we are working on a new colour tool for you. Seen a colour you’d love to use on a project? Maybe it was at the beach, on a fabric or on a building, but you don’t know what that colour is or how to describe it? Resene ColourMatch can help. This colour-matching App allows you to simply take a picture from your smartphone and it will instantly match your chosen colour in the image to the nearest Resene paint colour. 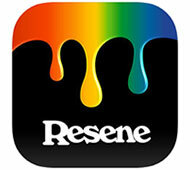 Resene’s ColourMatch application gives you instant access to thousands of Resene colours enabling you to colour match from any image taken on your iPhone™ or Android. Or use the colour spectrum to select a colour and find the nearest Resene paint colour. Anytime, anywhere, you can put the Resene ColourMatch system to work. Once you’ve matched your colour to a Resene colour, use Resene ColourMatch to find complementary colours simply by touching the screen. Save your matched colours into your Favourites so you can find them easily later and email them to colleagues, friends, family or yourself. With the built in Resene Colour Palette Generator, you can use the app to build a personal colour palette of Resene paint colours from a single image. Perfect for bringing your favourite places or images to life. You can also search directly for colours, and save and email favourites. Apps now available for iPhone™ and Android. If you need a precise colour match, visit your local Resene ColorShop or reseller and ask our staff about our colour match paint service.